Beckett Boutique | King Street, Charleston, SC » The One Piece That Will Keep You Styled All Summer! The One Piece That Will Keep You Styled All Summer! Have you been out in the world lately?! It may feel like everyone and their mother has had the same thought at once – white jeans. While we love our white jeans – maybe to death – it’s important to stand out from the crowd with something unique, but just as versatile. That is where your new best friend comes in, the work horse of your wardrobe this summer – Blush Jeans !!!! Trust us. Blush jeans will be ground breaking for you. Miranda Priestly approved. Actually we aren’t sure about that last part… but how could she not! Here we style our favorite, sellout blush denim 5 ways to show you just how useful and gorgeous these bad boys can be. Layer muted tones like this soft steel grey tank and then pop out neon accents to add the summer heat. We love this neon pink necklace that has note of orange in it to tone down the “pink” factor. C’est Chic! When layering, make sure your second color is far enough away in the spectrum to compliment your first tone, rather than clash. Here, the soft pink works beautifully with the almost red raspberry color. Throw in completely neutral accents to keep things grounded. This ensemble will pair well with a natural straw bag or summer wedges to act as neutrals! 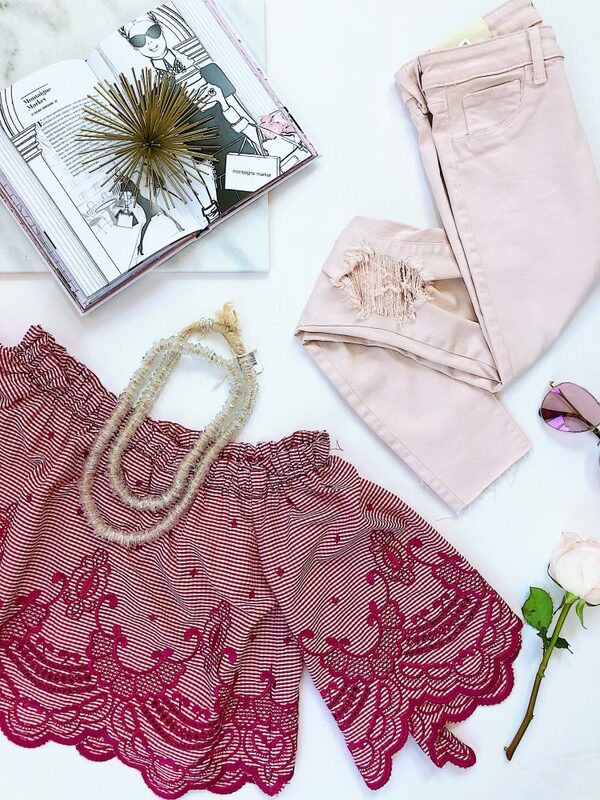 Bright but small patterns work so well when half your outfit is one color – (blush). We love how well polka dots add on the overall cuteness! 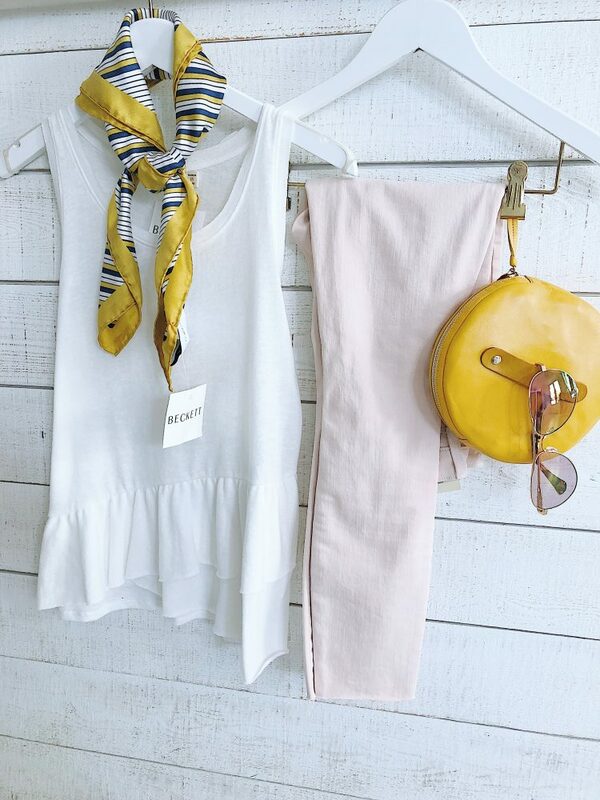 We threw in a small pop of summer neon to edge it out a little, but sometimes a new take on a “prepster” look is all you need to feel Rosé Ready. 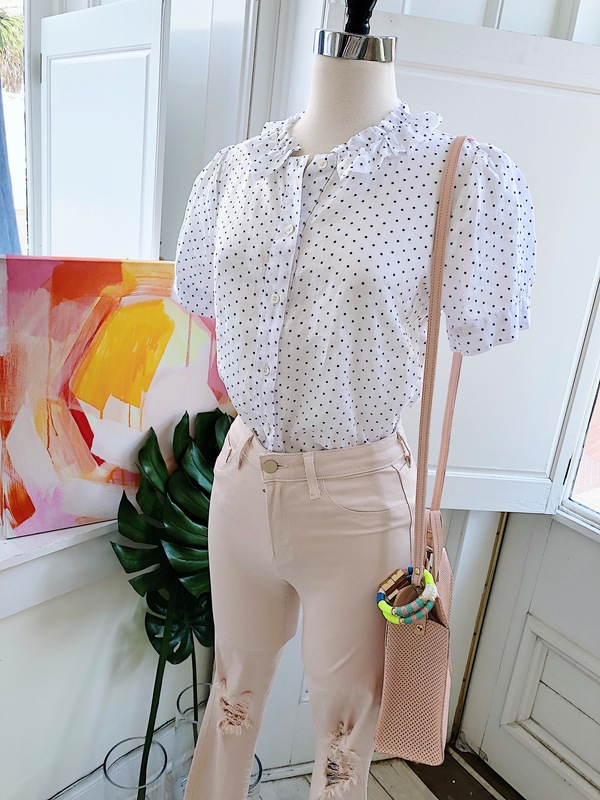 The best part about using a soft color like blush as your base instead of white is that you can be playful and unexpected with color combos while keeping things casual. Marigold or Mustard is Blush’s secret lover. They “marry” so beautifully together (Pun!!). See what colors are in your closet that could make people stop and stare! Blush can read as a sweet girly color. Add depth and balance by pairing a contrasting style with it! 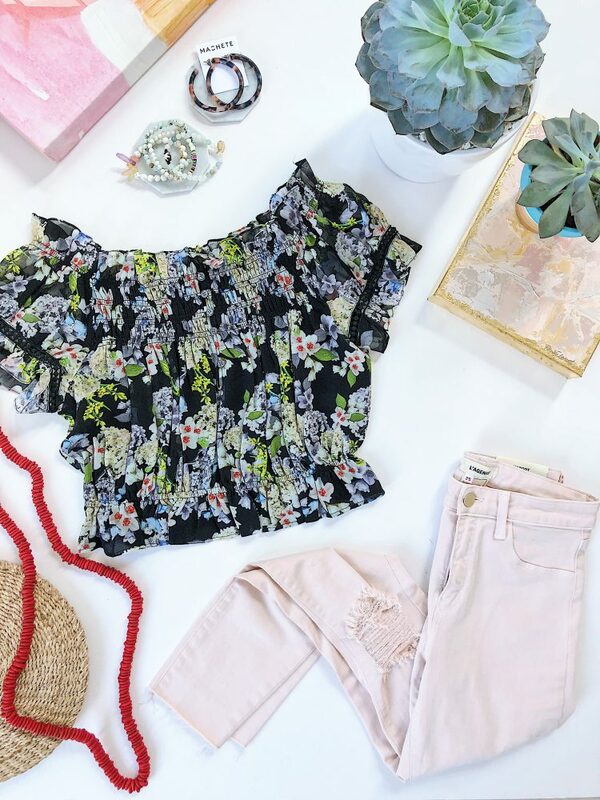 Here, the florals nod to that sweetness, but the black, red, and shape of the top punch it up with some boho chic! How would you style blush denim?! 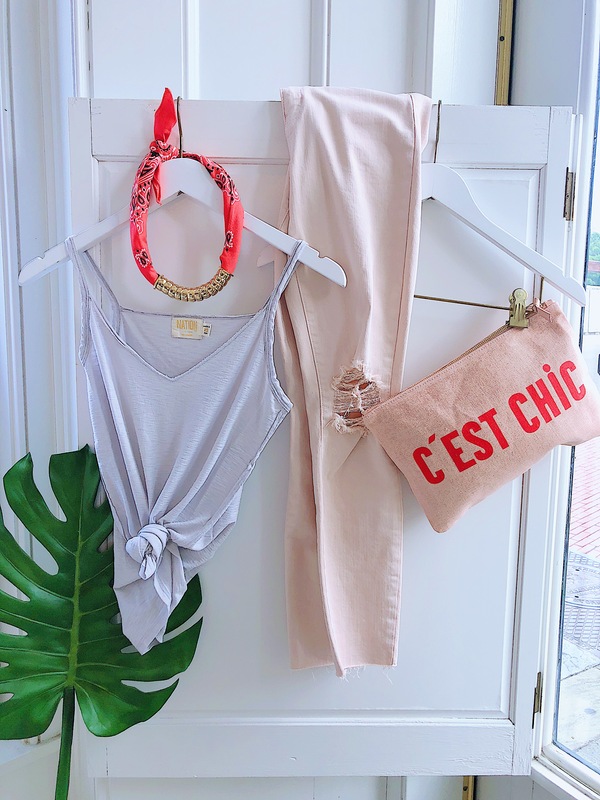 Tag us on Instagram (@BeckettBoutique) or send us a message and we will feature your styled blush look and give you 10% off your next purchase!